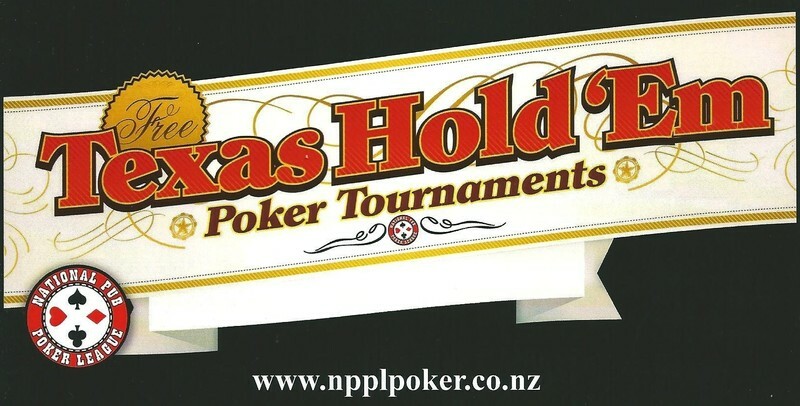 National Pub Poker League provides free, no-limit Texas Hold'em tournaments around New Zealand. Our games are very social and are a great place to get together with your mates for a beer and some cards. Our motto is 'Eat, drink, play!' and we encourage you to find your local event (most likely your local pub!) and come on down and play the world's fastest-growing game. To find out more about our nightly prizes, plus how you can qualify for our monthly, regional and national finals as well as your chance to play in Las Vegas see our website. Whether you're a first timer, amateur or 'pro player' our tournaments give you the opportunity to learn and develop your Hold'em skills. Here you can try bluffing, raising, playing short stacked and multi-table tournament play all without risking a thing! The league is perfect for those who just want to have a good time, as well as those who want to learn how to play against these looser, more aggressive players. Our trained and experienced Tournament Hosts are always on hand to answer any questions you may have.